The Cobblers are still assessing the fitness of midfielder Harry Beautyman after the midfielder suffered a knock to his knee in Tuesday night’s 3-1 Checkatrade Trophy defeat at Coventry City. Manager Rob Page is hopeful the former Peterborough United man will recover in time to be fit for Saturday’s tough trip to Sky Bet League One leaders Scunthorpe United, but admits he can’t yet be certain of his availability. “One of the positives for me on Tuesday night was when Beauts came on, because I thought he changed the game for us,” said Page. “He was positive, got into good positions and made clever runs for us, but then he has then unfortunately taken a knock. Beautyman has been a key player for Page this season, and his injury is a huge frustration for the manager, who made nine changes to his starting line-up for the match at the Ricoh Arena in an attempt to keep his team fit and firing for the trip to the table-topping Iron. But the knock suffered by Beautyman, a second half substitute at the Ricoh, in some way justifies the manager’s decision to challenge the EFL competition rules that say six starters from the club’s previous outing must start, and Page is making no apologies for doing so. “We have a big squad and it was an oportunity to give players some minutes, and that is taking nothing away from the competition,” said the Town boss. “We had a couple of knocks and injuries from the previous game on the Saturday (versus Bristol Rovers), and as a manager I wasn’t prepared to risk any of them with the game coming up this weekend. “It was an opportunity for people who havent played as many minutes as they would have liked, and as a player myself I always wanted an opportunity to show what I could do, and some did that and some didn’t. 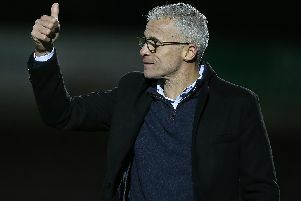 And explaining further his decision to leave the likes of Zander Diamond, Paul Anderson, Matty Taylor and Alex Revell out of the match day squad completely, Page added: “Gabs (Zakuani) was away and we wanted to give Zander a rest as he has played every minute of every game, and four games in the space of 10 days. “Was I going to run the risk him getting injured and then we have got what we have got for the Saturday? No, I wasn’t prepared to do that. “I stand by my decision to make those changes, and it was a disappointing result because we hate losing games whatever competition it is in.